What are some problems with the Amillennial interpretation of the Bible? Dr. Reagan: Amillennialism is the idea that the Millennial reign of Jesus Christ began at the cross and continues to this day, and that Jesus is reigning over the world from Heaven at the right hand of His Father. What are some problems with that viewpoint? Dennis Pollock: What they are saying is that the promises of Revelation 20 concerning a literal 1,000 year reign of Jesus Christ right here on this earth are being fulfilled even today. But, if you look at Revelation 20, the chapter describes some things that are amazing. It describes Satan being thrown into a pit so he will deceive the nations no more. If someone is trying to tell me Satan is in a pit and is deceiving the nations no more, I would say to them, "What part of 'deceive the nations no more' do you not get?" Deception is everywhere here in America and every other country. Dr. Reagan: One time I was teaching on this. I taught that Amillennialism teaches that Satan is now bound. Well, I had a guy jump up right in the middle of my teaching and say, "Wait a minute! Wait a minute. You're saying they believe Satan is bound now?" And I answered, "Yes." He said, "Well, brother, I want to tell you something, if he's bound now, he's bound on a very long chain because he's always gnawing on my leg." Dennis Pollock: Yes, and if Satan is bound now, someone needs to inform him that he's bound, because he doesn't seem to know it. One other problem with the Amillennial viewpoint is that they have no use for Israel at all. That viewpoint declares that God's miraculous restoration of Israel that He has accomplished in bringing the Jews back to their ancient homeland and restoring them as nation and restoring the land back to bounty and restoring their military to be a world power, doing all that He has done to create Israel which is something that's never occurred in the history of our planet, all of that is meaningless and at best it's just a coincidence. It has no prophetic significance. God has no more use for Israel, they believe. To come to that conclusion, you'd have to deny so many Scriptures. It's like you just start ripping pages out of your Bible. To me it's absurd. Nathan Jones: The ministry received an email recently from a guy who said the modern Jewish state is a construct of the Illuminati. Now, wait a minute, if the whole world is supposed to be against Jerusalem at the Tribulation and against the Jews, then why would the whole New World Order go to the trouble of building Israel? That'd be crazy! I would also add as we talk about the nations, is that during the Millennial Kingdom Jesus rules and reigns as King of Kings and Lord of Lords over all the nations who are in subject to Him. The nations of the world at that time are not in rebellion, but in obedience, to Jesus Christ. Now, I don't know about you, but you look at the world today and see the dirty politics and how messed up the world is and you've got to wonder, "Are these nations subjected to Jesus Christ?" Dr. Reagan: If Jesus is reigning today over the nations of this world, He's doing a very poor job of it. Nathan Jones: Jesus would be totally inept as a ruler, for the nations now are in outright rebellion against Him. Dennis Pollock: If Jesus is ruling the nations now, I would be tempted to say to the Lord, "Is this the best you can do?" 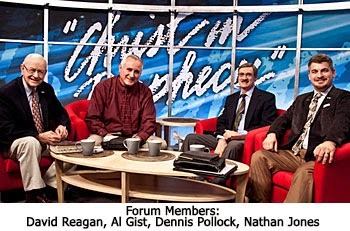 In the fourth and last segment of our forum on the Millennium, we'll ask our Bible prophecy experts to explain the historical change in the Church's method of interpreting the Scriptures. President Antichrist (as in "an" not "the") is doing his best to bring on the Tribulation!